Q: Tell us about the series of proposals prepared by you on a new election system? A: These proposals on a new election system were prepared by me. These proposals are free and independent and do not belong to any political party. I strongly believe these proposals will be h elpful for the development of our country. In 1995 I submitted these proposals to the then Parliamentary Select Committee. In 2007, it was printed as a booklet. Since introducing a new electoral system has become one of the most discussed topics at present, I thought it will be timely to republish these proposals in all three languages. I have already submitted this to the Election Commissioner. We are planning to give them to all political parties. Q: You are a Consultant Cardiologist by profession. Why did you publish this book on a new electoral system, which is a totally different field? A: Cardiology is my specialty. My job is lecturing at the General Sir John Kotelawela Defence University. I always had an interest in Sri Lanka’s electoral system. For the last 20 years I have been studying the electoral system. I always believed the current system would never work. I studied Sri Lankan and several other electoral systems. It took many years for the people in this country to realise that this system needs to be changed. However, I am glad that it will soon become a reality. I have several other interests too. Investigating myths and giving lectures are some of my other interests. As a professional, I believe it is our duty to share the knowledge we have with other people. Q: What are the key features in your proposed electoral system? A: It is no secret that there are many shortcomings in the existing system, especially in appointing representatives to Parliament by way of preferential election system. Therefore, several election systems have been proposed. We all know there are pros and cons in the proportionate representative system and the simple majority system. I personally believe a new system prepared by amalgamating the beneficial portion of the proportionate system and those of simple majority representative system will be more appropriate. My proposed system will reduce the disadvantages existing in the said two representative systems. 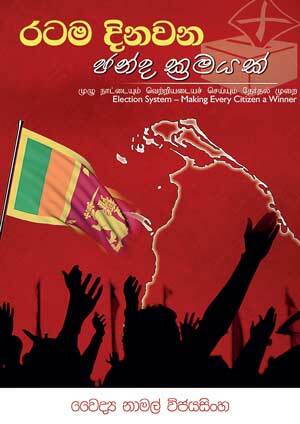 Sri Lanka is a country consisting of many political parties and different ethnic groups. We believe that the most suitable election system is the proportionate representative system. However, in this system, there is no suitable arrangement to decide as to who is elected to be sent to the Parliament. Therefore what we propose is to decide through proportionate system is the number of members elected to be sent to the Parliament from any party and considering the number of votes received by the candidate at the electorate they contest as a percentage of the total number of votes of the said electorate and to elect them according to a system corresponding to a simple majority representative system. My proposals consists of such a new election system composed of both proportional representative system and simple majority representative system. Meanwhile, a serious shortcoming in the current election system is that various political parties and candidates coming forward for elections are deprived of equality. This is mainly because Government Ministers are contesting in their same positions. All candidates should resign from the position they hold and must contest as equal persons. This should be done under the supervision of a committee in which the Election Commissioner too is included. Before the election the Parliament should be dissolved and the administration of the country should be handed over to a temporary caretaker government. This caretaker government should be given to the Chief Justice or to any other independent individual and should consist all party leaders represented in the Parliament. Q: You have suggested a commission for deciding electoral limits. Can you elaborate more on this commission? A: By having a commission for deciding electoral limits, the entire country should be divided and shown as five provinces. The five provinces are decided considering the geographical characters and convenience for administrative affairs. I believe that the best system for this is to divide the country as Ruhunu, Maya, Pihiti, Malaya and Jaffna. The entire country should further be divided into 25 electoral districts, including about five districts per each province. However, this can be discussed further in order to decide which areas should be included in each province. Q: What are the other important proposals in your new system? A: I have suggested a simple and easy-to-understand ballot paper. This is similar to the ballot paper that was used in Sri Lanka before 1978. During nominations separate lists of candidates for each electoral district should be forwarded. Number of candidates in the list should be equal to the number of electoral divisions of the district and as electoral divisions of the district and an electorate reserved for each candidate. Candidates should be prepared representing all electoral divisions of the district. Meanwhile, it is important that the number of members elected to Parliament from any electoral district to be in proportion with the total number of votes received by each party in the entire district. When deci ding the number of members on proportionate basis the 5% limit of votes should be removed completely. In my new system I am proposing multi member seats but this is different to the multi member seats in elections prior to 1978. What I suggest in this proposal is not pre-decided and are dynamic. They are determined in the manner how the people casted their votes at the election. These 25 members are selected on national basis and another 25 bonus members are selected as one person for each district and because all elected members represent some electorate in the Parliament, a total of not more than 50 electorates become multi member seats. Q: Your new system says the existing National List should be abolished. Why? A: Yes, I strongly believe the National List system should be abolished and no member should be appointed to Parliament without approval of the people. Because of this system the voters lose the ability of preventing appointment of a person whom they dislike to be in the Parliament. Q: But the idea of a National List is to appoint experts in various fields as MPs. Why do you want to prevent that? A: When you think of the members who got appointed by the National List so far, it is no secret that most of them did very little for the benefit of the country; most appointments were against the concept you talk about. Q: Are you denying that Parliamentarians such as Prof. G.L. Pieris, Prof. Tissa Vitarana, Dr. Harsha de Silva and Eran Wickramaratne who were appointed from the National List have done tremendous service to the country? A: They have been engaged in politics and recognised as politicians. They have also contested at instances. What I am trying to say is this is against democracy. These National List members are not appointed by the people. If a Government needs experts, it can appoint them as advisors, directors general and secretaries. Take the 19th Amendment; it was not prepared by MPs. I think that is the best way to obtain the service of the experts in different fields. Q: In your proposal, how do you address the issue of minority parties? How do they get into the Parliament? A: They get a fair chance. If they get enough or proportional number of votes they don’t have to win a seat to get into the Parliament. If the small parties have a sufficient number they either get into the Parliament from a district or from the National List. They have the best chance in this system. 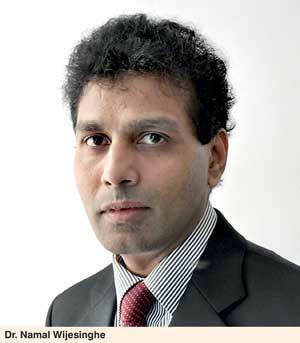 Q: In the new election system what are your recommendations on the provincial councils? A: The current provincial council was introduced to decentralise the power as a solution to the ethnic issue. But unfortunately today it has become a white elephant burdening the country with a large expenditure. The provincial council system today has been wastage of billions of rupees to maintain hundreds of provincial council member and their staff. On the other hand by electing members to Parliament and members to provincial councils separately from the votes of the same people who live in a certain province, it cannot be imagined that the power within that particular province can be decentralised. In my proposal what I suggest is that all members who represent the electorates in a particular province should get together to set up the provincial council. The controlling of that provincial council shall be entitled to the party which has the maximum number of members out of the members who represent that province. Therefore, at an election sometimes the majority of the central government may be owned by one party while the majority of a provincial council might be held by another party. As all members and ministers of provincial council in this manner are representing in the Parliament too, it will be possible to have a good relationship between the provincial council and the central government. By this way it will be easy to decentralise the power that will be favourable for the development of the country. Q: What is the difference between the 20th Amendment that is in discussion and your proposed election system? A: I have read the document that was available to me. What they are trying to introduce is a system similar to the one in New Zealand where two ballot papers are given to the voter. The voter can cast one vote for the party and the other vote for the candidate. People who win an electorate have a preference. But to select the number of people going to the Parliament is decided from the party vote. Take the SLMC and other minority parties; 65 people have won their seats but from the party vote only 50 people can go to the Parliament. Then there is a problem again because they will have to remove 15 people. That is called the first past the post system. My system will eliminate that too. As a country, as a society, we need to educate the people about the importance of their vote. If the voter is aware how powerful his vote is and what changes it can to the country we will have less problems. In our country we have all kinds of politician; there are politicians with no educational qualifications and there are some known to have bad reputation. But still they get elected. People don’t realise these politicians buy their vote. In a country like New Zealand these types of politicians will never come into power. Not only that, a party will never field such politicians because they very well know that people will vote them out. Sri Lanka needs to be like that. What is the use of introducing new electoral systems, laws and regulations if people don’t realise this simple fact? This is why we need to educate people about these matters.